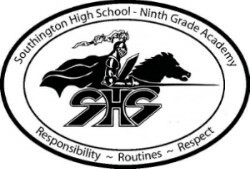 The Southington High School Ninth Grade Academy provides a continuum of services and supports to promote academic success, social and emotional growth, and post-secondary career exploration for all students. Click here for the 2019-20 Program of Studies. Updated Feb. 13, 2019. Click here for the 2018-2019 Program of Studies. Updated Feb. 9, 2018. Click HERE to request tutoring. Click here for the Grade 10 Course Registration sheets. Students will be dismissed a few minutes early on the first day of school to make sure they get on their bus in a timely manner. Need extra help in Math? Visit room E280 during your Lunch or Study Hall, periods one through eight. A Math teacher is available to provide you with assistance. Need extra help with writing assignments or English homework? Visit the Writing Lab located in the library during your LUNCH or Study Hall, periods 1-8. An English teacher is available to provide you with assistance.